The can: I love the look of Maui Brewing Co.’s Bikini Blonde Lager so much that I tried to buy a t-shirt with the beer label on it. I found some in Waikiki, but unfortunately the logo was printed on the back of the t-shirt – not on the front of it, like I wanted. Not only do I consider it something of a rarity to see a t-shirt these days with the logo on the back of it instead of the front, but in the New Zealand winter I’ll likely be wearing the t-shirt underneath a jacket – so no-one will be able to see the logo on the back of the t-shirt. Epic fail. But I digress. What’s not to love about the classic look of the Bikini Blonde Lager? It’s a smiling blonde woman wearing a lei and a grass skirt, holding a beer. Alas, it would have made for a terrific souvenir t-shirt. Bikini Blonde is a fresh hand-crafted Helles Lager brewed with the finest German hops and barley. Not skimpy on flavour… bold, smooth and refreshing. Brewed and canned at Maui Brewing Co., Lahaina, Maui, Hawaii. It also says that this beer is brewed with aloha, and it won a silver award at the World Beer Cup in 2006. Tastes like: The end of a great day surfing at Waikiki. When I’m reaching for a beer, Bikini Blonde Lager by Maui Brewing Co. wouldn’t necessarily be the first beer I’d grab – so let’s just get that out of the way right now. I’d much rather Maui’s Big Swell IPA. After a lifetime of mainstream, mass-produced lagers, I’ve just sort of had my fill of all lagers in general. However, this isn’t a bad lager by any means. It’s sweet, floral taste is inoffensive at the extreme; it’s just not particularly exciting. You could think of this one as more of a gateway beer into more interesting lagers and craft beers, but for those of us who have been spoilt for so long by very flavoursome beers, this one is just a little bit mediocre. Is it the best beer ever? 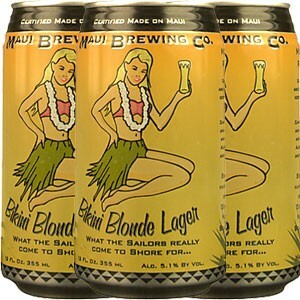 Bikini Blonde Lager isn’t even the best beer by Maui Brewing – that’d be the Big Swell IPA, in my opinion. However, judging it purely as a Helles Lager, Bikini Blonde Lager is very serviceable. I like the slight Hawaiian twist, but perhaps they could have done more with it. I’m still perfectly happy to drink it, though. What else should I drink? If you like this beer, you’ll also enjoy Kona Brewing Co.’s Big Wave Golden Ale, which I gave a positive review. I reckon Bikini Blonde Lager is better than Kona’s Longboard Lager, though. Support these Hawaiian breweries and see what you think.